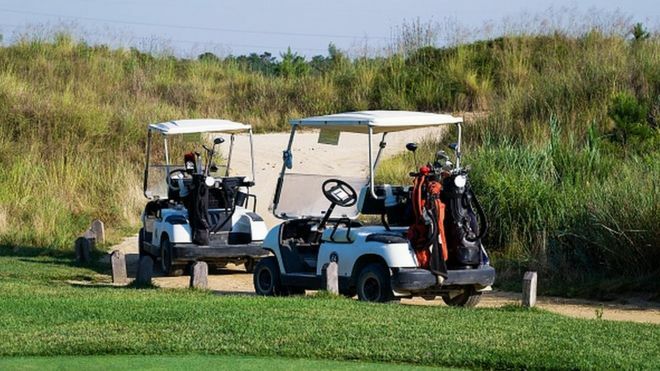 The next time you are driving a golf buggy in the vicinity of a river or an expanse of water, take care … it could cost you our life. The men were driving in separate buggies with their wives when the vehicles collided at a pier along the Nan river. One man drowned after falling into the water with his wife - the second died after jumping in to save them. Their caddie also fell into the river but was rescued by a local fisherman. "Their wives said both were able to swim but I think the cause of drowning was the strong undercurrent," a police spokesperson told AFP. The bodies of both men - Jaseoong Ha, 76, and Jun Yong Sung, 68 - have been recovered by police. This story was corrected on 28/12/2018to reflect that both men were driving in separate golf caddies with their wives when the incident took place.